I’m a little bit terrified of Belgian beers. The first time I ever tried one I spit it out–it was cloyingly sweet and like no beer I had ever tasted and not in a good way. Okay, and if we’re being perfectly honest my fear also stems from the unknown; apart from having some association with a small country in Western Europe, I know next to nothing about the style. 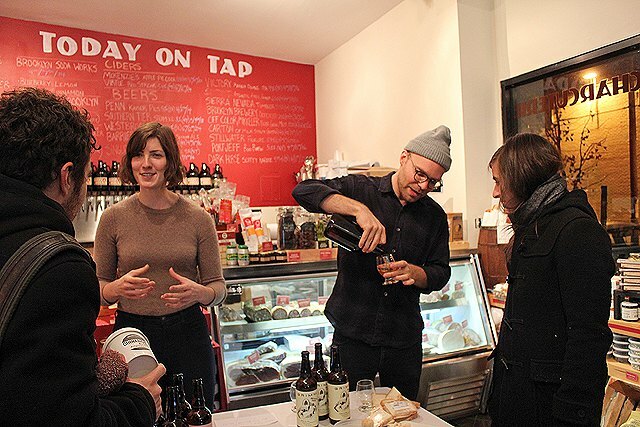 I was a bit hesitant to express my Belgian trepidations to the folks from Grimm Artisanal Ales as they professed their love of Belgians while pouring me a sample of their new Rye Abbey Ale , Going Awry, at Hops & Hock’s grand opening this weekend. But I was glad I did, because I learned a bit more about the style and there’s a lot to appreciate. Grimm Artisanal Ales’ Going Awry pours a light orange with a little bit of white head and smells slightly sour and lightly fruity. It’s sweet, but not overly so, finding a nice balance for its caramel and apricot flavors in the slight spice from the rye. Normally I would attribute the fruity tones in a beer to the hops and any sweeter ones to the malts, but Lauren Carter Grimm and Joe Grimm (the brewing duo behind Grimm) set me straight. They explained to me that one thing that makes Belgians special is that much of their taste comes from the yeast, a highly underrated agent of flavor in most America beers. In the Going Awry most of the fruitiness comes from the Trappist yeast they used. To achieve the high 8% ABV without adding tons of hops and malts that would mask the yeast’s flavors, the Grimm brewers added lots of simple sugar to the brew. Yeast can convert plain sugar into alcohol without leaving behind the residual sweetness that come from breaking malt down into alcohol. The end result is a superbly balanced dry brew, with very little in common with the first "Belgian" I ever tried. That’s a pretty nifty trick. But we can’t let the yeast take all the credit for this delicious brew. The rye also gets its due respect in its namesake ale. “In the US rye is a cover crop [so farmers] aren’t looking to get any specific flavor profile,” Joe said. “It’s a utilitarian grain.” Not to these guys though. Joe and Lauren sourced heirloom rye locally from Thor Oechsner Farm in Newfield, NY and had it malted locally for this beer. The rye they settled on is fruity and less spicy than the standard industrial rye best known in America, and its selection belies a deeper intention of the brewery: incorporating local ingredients into their brews. 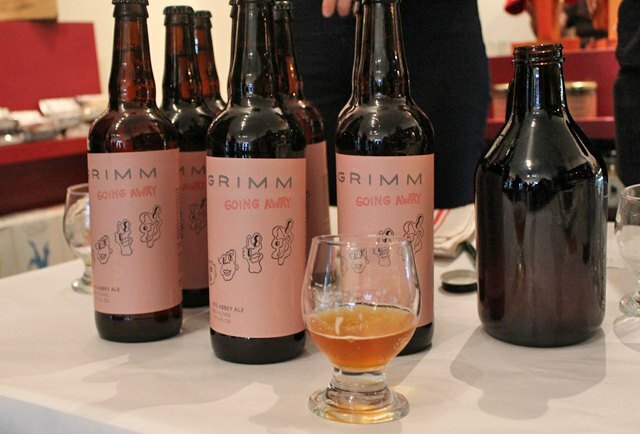 Grimm Artisanal Ales is a gypsy brewery–which means they brew their beer on other folks’ equipment, saving them a ton of overhead and allowing them to brew small batches of creative and experimental beers. The husband and wife brew team is comprised of Lauren Carter Grimm and Joe Grimm who started as homebrewers eight years ago. 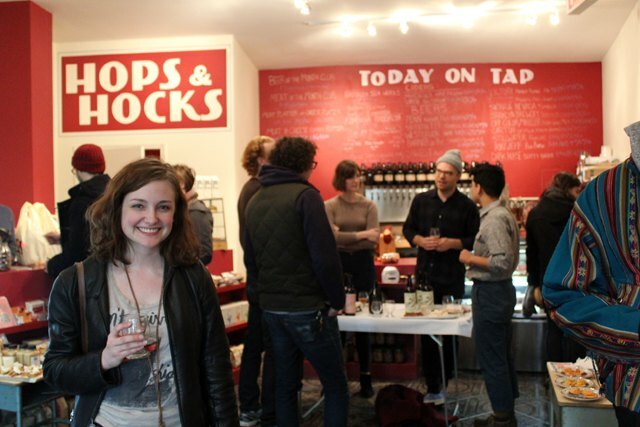 “We were just really excited by fermentation,” said Lauren. “We’re very interested in the way flavors are transformed by microbiology,” Joe added. Hence their love of yeast as a flavor contributor, not just the little guys doing the heavy lifting with no creative input. Lauren and Joe started pickling "everything" then moved on to making Kumbucha, ginger beer, mead, and finally Belgian beers after a music gig took Joe to Brussels and he fell in love with the style. This summer marked the grand start of Grimm Artisanal Ales. Going Awry is their fourth beer, currently available by growler or bottle at Hops and Hocks, one of our new favorite beer destinations. The Grimms, who live in Gowanus, have big plans for future brews, but not so much for getting their own physical location, as their gypsy brewery status allows them to be experimental and they like it like that. They currently distribute at select locations, luckily for us at Hops and Hocks (where I recommend you pick up some abbey aged cheese to pair with it) and also The Sampler, who currently has From the Hip, a Belgian ale brewed with rose hips, on tap. They are unveiling their fifth brew the Tuesday after Thanksgiving at Owl Farm in Park Slope. It’s an imperial stout named Cassiopeia and I’ll surely be there to check it out! Grimm Artisanal Ales' Going Awry Ale gets 4.5/5 stars, 1.5 for the unique use of hops as something other than mere "worker bees," 1 for the levels of subtle balance between hops and malts, 1 for the use of local ingredients that are responsibly sourced, and 1 for Grimm's commitment to creative brewing. 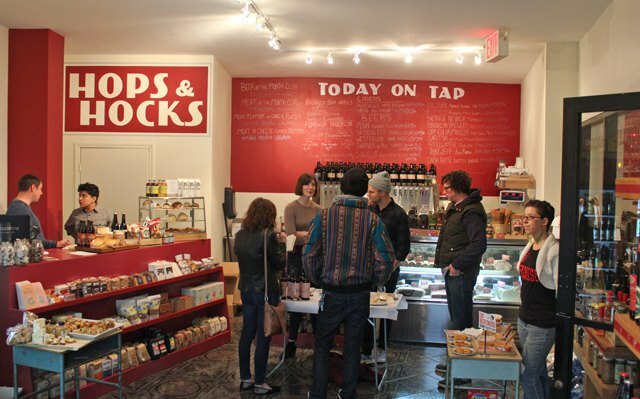 You can find Going Awry at Hops & Hocks located at 2 Morgan Avenue, just past Flushing. It is open daily from 11am – 8pm. A 22 oz bottle is $13.50, or you can purchase by the growler at $7.50 for 16oz, $14 for 32oz, and $27 for 64oz. Grimm Artisanal Ales will release their new Cassiopeia Imperial Stout Tuesday, December 3, from 6pm - 10pm, at Owl Farm located at 297 9th St in Park Slope. Come meet the Grimms and try all of their beers which will be on tap! Bushwick Brews is a weekly column dedicated to the exploration of Bushwick’s finest beers written and curated by brewista Erin Wicks. Let her know what you’re drinking and where via Twitter and Instagram, hashtag #bushwickbrews.